Huge capacity, great build quality, works incredibly well. Might be too large for smaller kitchens and households. Pretty heavy too at around 29kg. 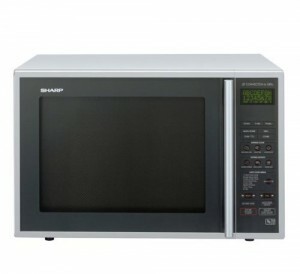 The Sharp R959SLMA is possibly the biggest silver microwave on the market - providing a massive 40 litre capacity. This makes it suited to large families and households, as well as a the commercial environment - such as Cafes, Restaurants, B&Bs and Hotels. In terms of power, it provide 900w when in microwave mode, but as a combi microwave, it also provides a grill and convection oven facility. The Grill mode is 1400w, and the convection oven facility has a temperature range of 40-250C. The exterior is a smart silver stainless steel finish - it both looks good, and feels like it is built to last. 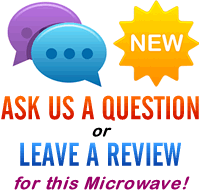 All of our testers were impressed with the overall look and build quality of this microwave - it feels like it will put up with years of use. The overall dimensions of this Sharp combi microwave are pretty big - as a result of it's large capacity - it measures 55cm by 53.7cm by 36.8cm, with interior measurements of 37.5cm by 27.2cm by 39.5cm. Overall weight is pretty substantial - 29kg in total - so best suited to worktops and strong shelves. Bear in mind that when cooking food, the weight will obviously increase further still - so if in doubt, place this appliance somewhere that can easily accommodate this weight. The LCD display is crystal clear to read, and the well illustrated controls are simple to use, posing no problems for any of the test team. The shelves enable you to cook batches of food simultaneously - ideal for larger families. It also provides the facility of being able to program the various modes in a sequence - i.e. 20 minutes of microwaving followed by 20 minutes of grill and/or convection oven - ensuring your food is cooked and finished to perfection. Despite it's size, it cooked to perfection during the test - baking, grilling and microwaving modes all performed well, and we wouldn't hesitate to recommend this microwave to our readers. The Sharp R959SLMA is a considerable investment - however it provides a very large capacity, and performs very well indeed - if you're after a large microwave, then the Sharp R959SLMA comes highly recommended.